This report produced by Sandbag uses our globally renowned E3ME model to investigate how recently agreed climate and energy policies would change EU greenhouse gas emissions reductions. We worked with the client to develop a baseline case and set of scenarios based on different levels of ambition in reducing greenhouse gas emissions. Each scenario was based on a set of policies at European and national levels and E3ME was used (in particular the FTT modules) to assess how effective the policies would be at reducing emissions. Please find the full report on the Sandbag website here. The modelling shows that when the EU’s new climate policies are included – especially including Member State coal phase-outs – EU emissions will fall faster than previously predicted. We also modelled how ambition can be increased further if moderate adjustments are introduced to the currently existing legislative framework, as well as if improvements are made in interactions between this wide-ranging portfolio of policies. 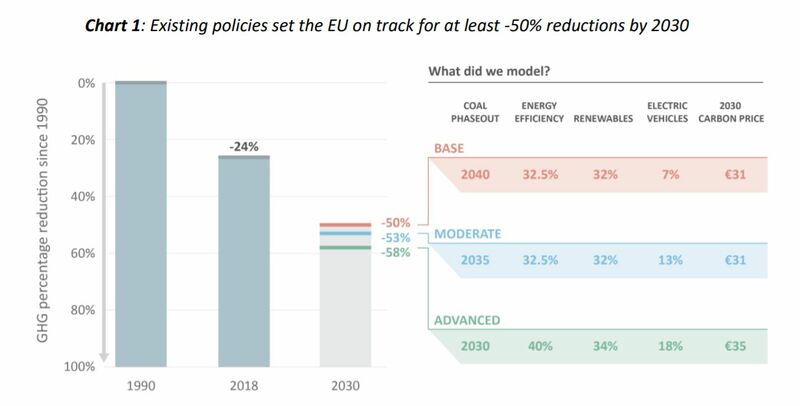 The key challenge was finding a set of policies that could meet the different EU environmental targets simultaneously, including substantial uptake of renewables in a relatively short period of time. Our modelling work with E3ME was complemented by specific analysis of the EU Emissions Trading Scheme (ETS) that was carried out by Sandbag.